On Sale Now! Save 3% on the Woodwind Instrument Repair Tool, Steel Spring Hook Repair Maintenance Tool for Saxophone, Clarinet, Oboe, Flute by VGEBY at Bass Brass. MPN: VGEBYrf6cigmnet. Hurry! Limited time offer. Offer valid only while supplies last. Features: 1.QUALIFIED STEEL: This spring hook repair tool is made of qualified steel, solid, firm and durable to use, ensures a long time service. 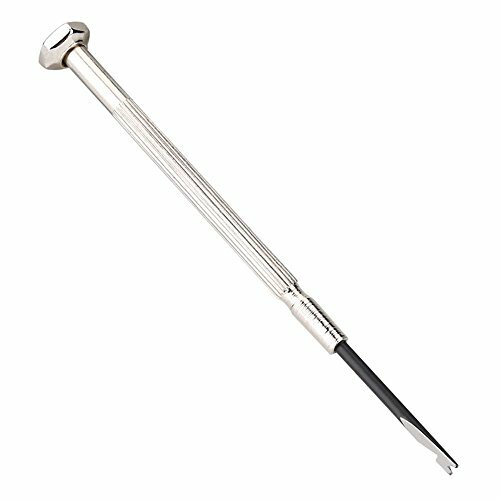 1.QUALIFIED STEEL: This spring hook repair tool is made of qualified steel, solid, firm and durable to use, ensures a long time service. 2.MAINTENANCE TOOL: It is used as installation and maintenance tool for disassembling, installation, remould and bore for spring needle. 3.WIDE APPLICATION: Suitable for Saxophone, Clarinet, Oboe, Flute, Piccolo, Bassoon, but not for trumpet instruments. 4.EASY TO CARRY: Lightweight and portable, easy to carry. Essential tool for orchestra and DIY enthusiasts. QUALIFIED STEEL: This spring hook repair tool is made of qualified steel, solid, firm and durable to use, ensures a long time service. MAINTENANCE TOOL: It is used as installation and maintenance tool for disassembling, installation, remould and bore for spring needle. WIDE APPLICATION: Suitable for Saxophone, Clarinet, Oboe, Flute, Piccolo, Bassoon, but not for trumpet instruments. EASY TO CARRY: Lightweight and portable, easy to carry. Essential tool for orchestra and DIY enthusiasts.